Politics Overshadows U.S. Tech Firms' Hopes For Entering Iran : All Tech Considered With a young, well-educated population, Iran has the potential to be a boom market for tech. But sanctions and negative political implications for doing business there seem to limit prospects. 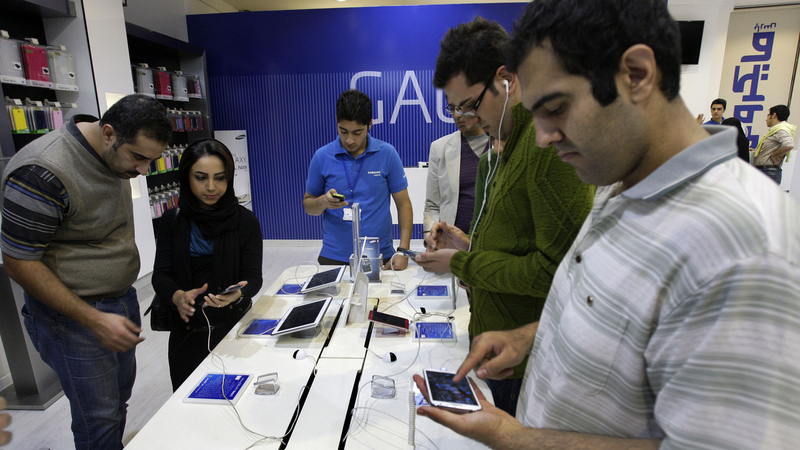 Customers try out cellphones and tablets in a store in Tehran, in 2012. Financial sanctions make it difficult for U.S. firms to do business in Iran, analysts say. Iran has the potential to be a boom market for American tech companies. The majority of the population is under 30 and well educated, and over half the country has access to the Internet. Many businesses have to wait until more sanctions are lifted, but certain tech companies can already go into Iran legally because the U.S. has lifted sanctions on various communication technology. They just aren't sure they want to. The rationale behind lifting the sanctions on the sale of certain technologies in Iran has its roots in the 2009 election protests. Hundreds of thousands of Iranians took to the streets because they believed the election had been fixed by conservative clerics. Much of what the West learned about the demonstrations came from videos leaked by demonstrators to YouTube and messages they put on Twitter. Collin Anderson is an independent researcher who consults with human rights organizations and tech companies about Internet censorship. He says that during the protests Iranians had access to American technology — like iPhones and Windows software — through black markets. "There's been a recognition for the past five years or so that increasing access to technology in Iran for the Iranian public is a greater good," Anderson says. When Sanctions Lift, How Will Iran Spend Its Billions? So, last year the Obama administration lifted sanctions on American tech companies that sell personal communication technologies. "It is fully legal to sell cellphones, laptops, tablets, modems, Wi-Fi routers and most of the software that most people use every day," says Vivek Krishnamurthy, who teaches at Harvard Law School. But, Krishnamurthy says, that hasn't meant that American tech companies have jumped into Iran — there's still no Apple Store there. "Doing business with Iran is extremely difficult today because of the comprehensive financial sanctions," he says. "It's really hard to get money in or out of the country." But, doing financial transactions may get easier if the U.S. and Europe reach a deal to lift the sanctions. And American tech companies have a good reputation in Iran, says Fraidon Korangy, an Iranian-born tech entrepreneur. He started several companies in the U.S., but he now lives in Iran. Korangy says most young people in Iran want to grow up and be Steve Jobs — not Ayatollah Khomeini. He says China and some European countries have left a bad impression. "Especially the Chinese have taken advantage of them because of the sanction regime," Korangy says. "They've sort of said, 'OK. Nobody else will deal with you. We'll deal with you but at a significant premium.' "
He says that includes marked up prices and delays in completing projects. Despite the ripe climate for business in Iran, American tech companies have been very quiet about their plans. NPR contacted Apple, Google, Cisco and other big players. The only company that would admit to plans to enter Iran was Netflix. Internet researcher Collin Anderson cites the politics in the U.S. "If you are, for example, Apple, you certainly don't want to wake up tomorrow and have in the front page of a newspaper: 'Apple sells the Supreme Leader an iPhone,' " Anderson says. "That certainly is going to be perceived negatively in the United States despite whatever nuclear arrangement happens." Yet, there are some 80 million Iranians and the country has top-ranking engineering schools. Iran has its own nascent startup culture. There's an Iranian version of Amazon, Groupon, and the beginnings of a streaming music service, says Hamid Biglari, an Iranian-American who runs a data analytics company. It's the perfect environment for U.S. tech firms, he says. "From a purely rational business point of view, it would be insane for them not to want to access such a large market on a level playing field compared to the rest of the world," Biglari says. He says the best technology doesn't always win in a market — sometimes it's about who gets there first. And on that front — the complex politics between the U.S. and Iran may put U.S. companies at a disadvantage.